Meet Michael Proulx, our New Web Integrator! The Devolutions family is growing! Earlier this month, you met Jenny Knafo, our new Training Specialist. Well today, the introductions keep on coming, because it’s time to meet Michael Proulx, our new Web Integrator! The other day, I had a chance to catch-up with Michael. Below you’ll find my questions in bold, followed by Michael’s answers. Can you tell me a bit about your background? I have a degree in IT, during which I learned about software development. As part of my education, I was an intern attached to a high-profile, international software product. It was a very valuable learning experience, and something that I was proud to work on. I was also a cadet for 6 years, and I still volunteer as an airgun coach. How did you meet our CEO David? I met David for the first time during my interview! The interview experience was very enjoyable, and the dynamic was great. What are your first impressions of working here at Devolutions? The team is really friendly and energetic! The people here constantly grow and listen to each other. There is also a real commitment to listen to users, and pay attention to their needs. What does your job involve? What tools do you use? As part of the web development team for now, but I'll join the marketing team soon. My primary role is editing our websites and web pages. The tools I most often use are code editors, and navigators such as Chrome, IE, Firefox, Opera and Safari. What are some of your hobbies? While I love the IT world, I’m very passionate about airgun, which is an Olympic sport. Every Monday, I train in the nearby city of Trois-Rivières. 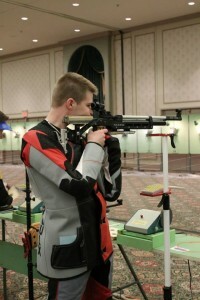 Right before starting this new job with Devolutions, I attended the Canadian Airgun Grand Prix (CAGP) in Toronto. I assure you, airgun is a real sport! And as I mentioned earlier, I volunteer as an airgun coach. What invention do you wish you had created? I wish I had invented the electronic target, which is used in airgun to calculate how many targets have been hit, as well as to instantly know where the lead is if a target is missed. Would you like to say something to our community? Technology is always improving, and it’s clear that the Devolutions team is also improving at the same time. I’m really excited and proud to be part of this group, and look forward to helping IT pros around the world build an awesome community together! Arrow_Left_MediumMeet our New Senior Software Developer: Denis Vincent!